The Texas Longhorns swimming and diving team took three of the men’s events and four women’s events on the second day of the Texas Hall of Fame Swimming Invitational at Jamail Swimming Center Thursday. The men won the 200-yard freestyle relay, the 50 free and hte 400 medley relay. The women were victorious in the 200 freestyle relay, the 500 free, the 50 free and the 400 medley relay. Tate Jackson, Townley Haas, Luke Bowman and John Shebat finished the 200 freestyle relay in 1 minute, 16.02 seconds. Grace Ariola, Julia Cook, Anelise Diener and Claire Adams won for the women in 1:26.84. Jackson also won the 50 free in 19.16, the best time in the NCAA this year. For the women, Ariola won in 21.86. Austin Katz, Charlie Scheinfield, Jacob Huerta and Haas won the 400 medley relay in 3:05.65. Adams, Olivia Anderson, Remedy Rule and Ariola won for the women in 3:29.99. Joanna Evans won the 500 freestyle in 4:35.76. The meet opened with the 800-yard freestyle relay, with the UT men winning and the women taking second on Wednesday. Drew Kibler, Jeff Newkirk, Austin Katz and Townley Haas teamed up to win the men’s event in 6 minutes, 14.29 seconds. The three-second victory was the fastest time in the NCAA this year. The men’s B relay team took fourth place. Sam Pomajevich, Luke Bowman, Sam Kline and Jake Sannem finished behind Stanford’s and Arizona’s quartets. The women finished the race in 6:56.33. Adams, Evie Pfeifer, Evans and Julia Cook teamed up for the second-best time in the NCAA this year. The B relay team, made up of Quinn Carrozza, Rule, Lauren Case and Nora McCullagh, took a top-five finish in 7:05.63. 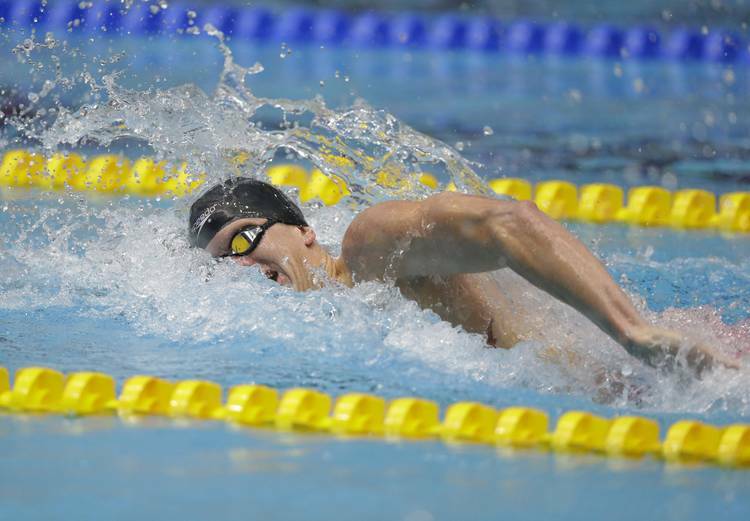 The Texas Hall of Fame Swimming Invitational continues Friday and concludes Saturday.